For most of us, mornings are the most hectic hours. We are so much bitten by this ‘hurry sickness’ bug to get our chores done that we don’t mind skipping breakfast, the most important meal of the day. The very term ‘breakfast’ says it. We have breakfast after a gap of nearly 10 hours after the previous night’s dinner. No other meal of the day has so much time preceding it. 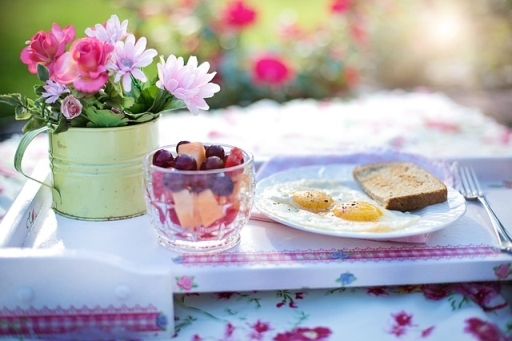 Breakfast is the first chance the body gets to replenish its energy levels after 8-12 hours without a meal or a snack. If you feel that skipping a breakfast can actually make you shed a few extra kilos, then you are mistaken. Some of us somehow manage to grab a cup of coffee/tea and a quick bite at some junk. But is this sufficient? Little or no breakfast will in fact make us hungrier during the next meal and we will probably overeat, thus predisposing us to gain weight. Moreover, it will make us tired and decrease our concentration levels at workplace too. According to BBC health, breakfast may play an important role in reducing the risk of type 2 diabetes, cardiovascular disease, intestinal polyps and colon cancer. A healthy breakfast should contain some protein and fiber. Make wise choices and stick to whole cereals, grains or fruits, fat free, cholesterol lowering diet. Stay away from sugary cereals, syrups, pastries, and white breads because they are digested quickly and will leave you tired in a couple of hours. * Chances of being addicted to smoking and alcohol. * More illnesses such as colds and flu. I can’t live without my organic oatmeal for breakfast.I’d add some nuts, some honey, and half an apple cut into little pieces - and I swear, guys, it tastes like heaven! Whether you are looking for something to serve for breakfast, lunch or dinner, eggs are cheap and extremely versatile. They’re also a great protein source which helps stave off eye problems as you get old. People eating breakfast feel better mentally& physically than those skipping breakfast!! Eat a healthy diet. Reduce red meat consumption. Eat a variety of fruits and vegetables. A balanced diet helps assure continued good health. Breakfast can help give us the energy we need to face the day, as well as some of the vitamins and minerals we need for good health. Some people skip breakfast because they think it will help them lose weight. But missing meals doesn't help us lose weight and it isn't good for us, because we can miss out on essential nutrients. There is some evidence to suggest that eating breakfast can actually help people control their weight. Avoid skipping the breakfast. Breakfast is the main thing in the morning. If you skip your breakfast you tend to get more sluggish as the time pass and your energy level decreases as the day passes. Great article. We will all be healthier by making better food choices and taking personal responsibility for what we eat. I usually start the day at home with a glass of Orange Juice, then when I get to work I have a Banana and a mug of Green Tea. About an hour later I have a good bowl of Oatmeal, with Apple Sauce in it. This saves having to add sugar. Sometimes I substitute Honey though for the Apple Sauce. So that is my way of staying healthy, filling up with good warming filling food. You should not delay your breakfast. If you don't eat when you get up you will slow down your metabolism for the whole day and it will be counterproductive to what you are attempting to do. Just stick to your routine, in the long run it won't matter. Breakfast is the most critical priority of the day. Make sure to include all three balancing ingredients-proteins, fats and carbohydrates. Fats and proteins can be avoided in case of a medical condition. Nutrition is the key to strengthen the mind and the body to deal with stress and fatigue. Also, during the day avoid snacking with fried food and white bread. Try to eat fresh food and avoid packaged or stale food. Never skip breakfast. It's the most important meal nutritionally of the day. Some protein, such an egg ( I hard boil a dozen and have 1 a day) and some high fiber cereal, and 6 oz of low sodium V-8 juice. A breakfast like this will get her metabolism working and she will start to burn calories more efficiently. Not eating breakfast is a terrible and unhealthy way to start your day. it's generally best to eat carbohydrates in the morning (which is why oatmeal is said to be such a good breakfast) and eat less in the evening (which is why having a huge pasta dinner is something people really miss when they are on a diet! but cutting out pasta can really make a difference to a dieter). Carbohydrates make energy for your body, which is why people who are training eat a diet high in carbohydrates. Remember that low-carb diet fad a few years ago? Well those people took it WAY too far, carbs are by no means the ONLY thing that affects your weight gain. Things like low exercise, fats, calories, not eating healthy foods that give you energy, etc all contribute just as much to gaining weight. The actual truth is that any energy not spent (by exercising) gets stored in your body, in the form of fat. But your body needs energy for everything, including regular cell activities, even making your heart pump - not just spending a half hour on the treadmill - so cutting carbs out of your diet completely is a really bad idea, and it'll just give you less energy and make you feel lazy in the end. But the amount of weight you could possibly gain from eating that is seriously so small it will make no difference in the grand scheme of things. However you should not eat that kind of thing before bed, fresh fruits or vegetables is much better. Save the healthy breakfast for breakfast, when you'll need the energy for the day! Choose your breakfast recipes such that they focus on a blend of protein and carbohydrates. Hearty carbohydrates will give that boost of energy to jump start your day. A mix of protein will be the staying power to keep your body going strong over the next three to four hours until lunch. Eating healthy breakfast has been proven to improve concentration, problem solving ability, mental performance, memory, and mood. Breakfast skippers usually fail to fit important nutrients into their diet. Many foods eaten at breakfast contain significant amounts of vitamins C and D, calcium, iron, and fiber. Never skip a meal, even if you’re on a diet. Eat a fresh fruit or have vegetable juice instead. Choose to be radiantly healthy. Keep yourself informed about the nutritive value of every food you buy. The guidelines you provided here are extremely valuable! Skipping breakfast is very common for people rushing to work. They could take few fruits with them and have it on their way. Or else skipping breakfast would lead to obesity and other health related problems. I often miss out on breakfast and feel groggy for a while in the morning it's probably because I don't have any thing to fuel me. Healthy breakfast helps to energize us throughout the day. It also helps in long term weight loss as we have less cravings if we have a healthy breakfast. Banana Stem is very fibrous in texture but tastes like banana.Banana Stem is very healthy and is widely used as a remedy for weight loss, Kidney stones and an effective diuretic as well as a laxative. Look for something that is high protein, has moderate to low carb, and has some fiber. Don't eat empty carbs from porridge and oatmeal, cereals, cereal bars, toast, etc. It is no different than binging on donuts or pizza even if they are "whole grain" or organic.